This article is about the city. For the former state, see Khanate of Kokand. Kokand (Uzbek: Qo‘qon, Қўқон, قوقان; Persian: خوقند‎, translit. Xuqand; Chagatai: خوقند, Xuqand; Tajik: Хӯқанд, translit. Xökand) is a city in Fergana Region in eastern Uzbekistan, at the southwestern edge of the Fergana Valley. The population of Kokand on April 24, 2014[update] was approximately 187,477. The city lies 228 km (142 mi) southeast of Tashkent, 115 km (71 mi) west of Andijan, and 88 km (55 mi) west of Fergana. It is nicknamed "City of Winds", or sometimes "Town of the Boar". Kokand's name derives from the well-known tribal family group of "Kokan" who belong to the Kongrat tribe of Uzbeks. Kokand is at the crossroads of the two main ancient trade routes into the Fergana Valley, one leading northwest over the mountains to Tashkent, and the other west through Khujand. As a result, Kokand is the main transportation junction in the Fergana Valley. Russian imperial forces under Mikhail Skobelev captured the city in 1883 which then became part of Russian Turkistan. It was the capital of the short-lived (1917–18) anti-Bolshevik Provisional Government of Autonomous Turkistan (also known as Kokand Autonomy). They sought co-operation from Ataman Dutov and Alash Orda. However, their emissary to the Amir of Bukhara achieved little. Jummi Mosque (right), a Friday mosque built in 1800-1812, and reopened in 1989, it can hold 10,000 worshipers. Amin Beg Madrassah, built in 1813. Dakhma-I-Shokhon, a necropolis of the Kokand Khans from the 1830s. Khamza Museum, dedicated to Kokand’s Soviet hero Hamza Hakimzade Niyazi. Islam plays a large role in the cultural life of Kokand. A number of madrasah can be found with the city. It is also home to a number of notable hanafi scholars, such as Abdulhafiz Al-Quqoniy and Yorqinjon Qori Al-Quqoniy. There are 2 institutes, 9 colleges and lyceums, 40 secondary schools, 5 musical schools, a theater, and 20 libraries. There are 7 historical and house museums located in Kokand. The black market provides nearly 75% of the income generated in the borders of the city. This includes retail, groceries, employment, money exchange, agriculture and manufacturing of many goods. A large part of the population works as small business owners in outdoor markets. Kokand is a center for the manufacture of fertilizers, chemicals, machinery, and cotton and food products. Over the last two decades, new districts and public buildings have been created in the city as well as many houses, shops, cafes, restaurants and other private sector ventures. Kokand is an education center with one institute, nine colleges and lyceums, and numerous museums. ^ Географические названия мира: Топонимический словарь. — М: АСТ. Поспелов Е.М. 2001. Wikimedia Commons has media related to Kokand. Tashkent is the capital and largest city of Uzbekistan, as well as the most populated city in ex-Soviet Central Asia with a population in 2018 of 2,485,900. It is located in the north-east of the country close to the Kazakhstan border. 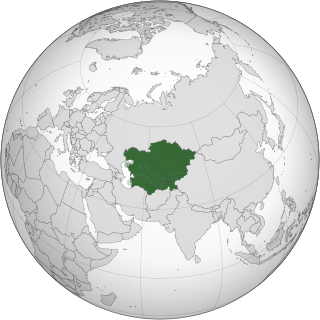 Andijan is a city in Uzbekistan. It is the administrative, economic, and cultural center of Andijan Region. 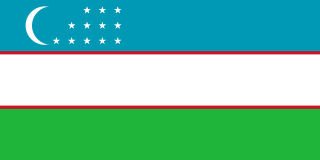 Andijan is located in the south-eastern edge of the Fergana Valley near Uzbekistan's border with Kyrgyzstan. Taraz is a city and the administrative center of Jambyl Region in Kazakhstan, located on the Talas (Taraz) River in the south of the country near the border with Kyrgyzstan. It had a population of 330,100, up 9% from 1989, making it one of the fastest-growing cities in the country, after Astana and Turkistan. Fergana, or Ferghana, is the capital of Fergana Region in eastern Uzbekistan. Fergana is about 420 km east of Tashkent, about 75 km west of Andijan, and less than 20 km from the Kyrgyzstan border. The Khanate of Kokand was an Uzbek state in Fergana Valley, Central Asia that existed from 1709–1876 within the territory of modern Kyrgyzstan, eastern Uzbekistan and Tajikistan, and southeastern Kazakhstan. The name of the city and the khanate may also be spelled as Khoqand in modern scholarly literature. Namangan is a city in eastern Uzbekistan. It is the administrative, economic, and cultural center of Namangan Region. Namangan is located in the northern edge of the Fergana Valley, less than 30 km from the Kyrgyzstan border. The city is served by Namangan Airport. Asaka is a city and the administrative center of Asaka District in eastern Uzbekistan, located in the southeastern edge of the Fergana Valley near Uzbekistan's border with Kyrgyzstan. Syr-Darya Oblast was one of the oblasts of the Russian Empire was part of Russian Turkestan. Its center was Tashkent. Nasruddin Khan, or Nasruddin Beg, was the last ruler of Khanate of Kokand, then a protectorate of the Russian empire. He rose to power in 1875 when his father Khudayar fled uprisings in the Ferghana Valley. The Khanate of Kokand was abolished on 19 February 1876, and the region annexed to Ferghana Oblast. Sayid Muhammad Khudayar Khan, usually abbreviated to Khudayar Khan, was a Khan of Kokand who reigned between 1845 and 1875 with interruptions. He was the son of Shir Ali Khan. During the reign of Khudayar Khan, the Khanate was suffering from a civil war and from interventions of the Emir of Bukhara. Subsequently, the Russian invasion into Central Asia first forced the Khanate to become a vassal of the Russian Empire, and in 1876 the Khanate was abolished as a result of the suppression of an uprising. In 1875, Khudayar Khan, who took a pro-Russian position, during the uprising had to flee to Orenburg in Russia. He died in exile. Shymkent, is a city in the Republic of Kazakhstan; one of three cities which have the status equal to that of a region. It is the third most populous city in Kazakhstan behind Almaty and Astana with an estimated population of 1,002,291 as of 1 June 2018. According to regional and city officials, the millionth resident of Shymkent was born on 17 May 2018. Shymkent is a major railroad junction on the Turkestan-Siberia Railway. The city is also a notable cultural centre, with an international airport. Shymkent is situated 690 kilometres (430 mi) west of Almaty and 120 kilometres (75 mi) to the north of Tashkent, Uzbekistan.